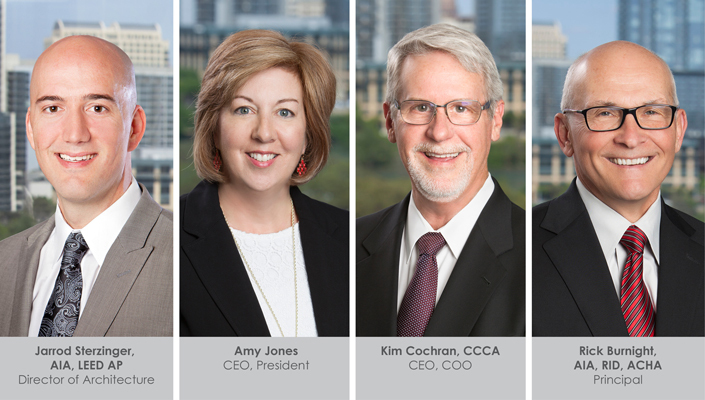 Austin, Texas — O’Connell Robertson is pleased to announce leadership changes within the company, completing the management transition program that began in 2016. Supporting the Firm’s vision to continuously elevate its design and expertise, Jarrod Sterzinger, AIA, LEED AP, has been named Director of Architecture. In this role, he will lead the architectural vision for the Firm across all project types, markets, and regions. Specifically, he will be responsible for fostering the design process, ensuring that quality and service exceeds client expectations and are executed at the highest level of professionalism. He will lead the development and implementation of a corporate design vision for more than 20 architects and designers in the Firm’s Austin and San Antonio offices, guiding all to provide the best design potential on every project. Jarrod also will continue to serve as O’Connell Robertson’s Education Practice Leader. Since joining O’Connell Robertson in 2008, Jarrod has led the design for numerous award-winning K12 and higher education projects, including Round Rock ISD’s Success High School, Austin Community College’s Elgin Campus and the UT Pickle Research Center Texas Advanced Computing Center. Additional executive transitions include the move toward a Co-CEO leadership structure for the Firm as Rick Burnight, AIA, ACHA leaves his position as CEO, a role he held for 13 years, to focus on key client relationships, new business development and special projects within the Firm. Under Rick’s leadership, O’Connell Robertson has achieved unprecedented revenue growth, increases in project scale and scope, and development of staff expertise. Building on their two decades of working together at O’Connell Robertson, President Amy Jones and Chief Operating Officer Kim Cochran will each assume the responsibility of co-Chief Executive Officer while continuing in their existing roles. The co-CEO structure was planned to take advantage of the skills and strengths of the Firm’s two leaders. Amy Jones joined O’Connell Robertson in 1997 and became the Firm’s fourth president in 2016. She will continue to focus on client relations, business development, strategic partnerships, and community engagement while overseeing the communication and implementation of the Firm’s vision, mission and strategic plans. Kim Cochran has more than 35 years of experience in the design and construction industry and became Chief Operating Officer in 2016. He will continue to focus on the Firm’s operations and infrastructure, including financial planning, business activities, organizational performance, and the daily operations of the Firm’s offices. Both Amy and Kim will continue to serve in project leadership positions as well.